Your print marketing materials are often your customer’s first impression of your business—so it’s vital that your postcard, mailer or brochure is designed to pack a punch and ensure lasting impact. Print marketing materials are an investment in your sales strategy and ultimately an extension of your sales team—they’re a critical way to get your foot in the door. 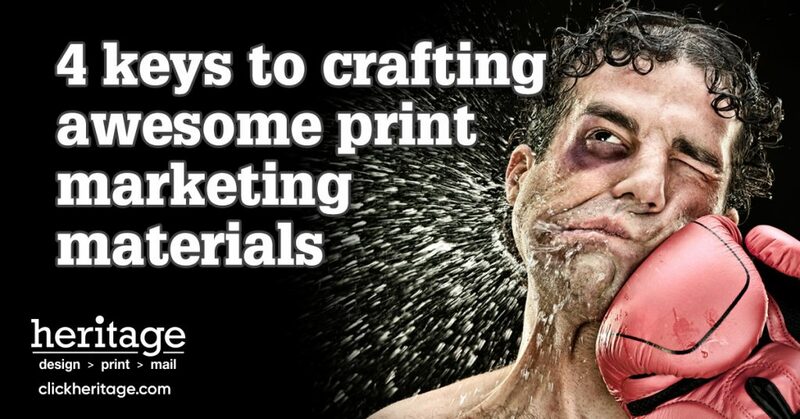 Here are 4 keys to crafting awesome print marketing materials your customers will love! The first key to designing effective print marketing materials is knowing your audience. Not simply who they are, but what they want: What will resonate with your customer? Your message may not be one-size-fits-all. Twenty-somethings will respond to your creative ideas in a completely different way than an audience of Baby Boomers. Your customer demographics may include both groups, so how can you craft messages to do double (sometimes triple) duty? It all comes back to data. Research your target market—not only by age, but by other data points too. What are their likes and dislikes? What commonalities do they share? What speaks to them? A busy young professional may not have time for a sales pitch but would review a succinct brochure. A postcard geared toward college students might not get read if they don’t sort through the household mail. If you need insight on your audience, talk to your sales team! They’re on the front lines. They’ll know what information customers want and how to package print marketing materials so they’ll get read. Space is one of the most basic elements of design. Even if you aren’t a graphic designer, keeping the importance of space in mind will help you craft direct, clear, effective materials. Simple, easy to read, and visually appealing print marketing materials look the most professional. Less is always more. Think of your print marketing piece as a bite—it catches the eye and informs but leaves them wanting another taste. Your print marketing materials simply need to open the door (or entice your audience to pick up the phone) and then your sales team will do the rest. A short, straightforward singular call to action is the most important part of your print marketing piece. Don’t overwhelm your customers with too much text and explanations. Simply capture their attention long enough to take just one action: learn more. You know running a business—but when it comes to design, you and your staff may be out of your element. Artistic tasks like designing print marketing materials, visually appealing brochures, and captivating postcards require specialized training and experience. Don’t be afraid to include design in your marketing budget—in fact, it’s a necessity. Your print marketing materials are representing both you and your brand. Potential customers look at each printed piece as a direct reflection of your business—and they WILL judge a book by its cover (or in this case, a business by its postcard). Skimping on visual elements will hurt you in the long run. Turns out, snapping quick photos with your phone won’t result in beautiful high-resolution images that catch your customer’s eye. Pay a professional photographer to take top quality photos to use in all your print marketing materials. High-quality photos and artwork speak to the heart of your audience, no matter the subject. Photos capture the subtle nuances of your product and help it really stand out. If your print marketing materials feature phenomenal photos, your customers will notice! A consistent brand and voice across all print marketing materials is crucial to the success of your company. All brochures, postcards, flyers, and more should look like they belong together and be instantly recognized as part of your brand. Keep this in mind when you’re working with the team designing your next print marketing materials. Is each piece cohesive with your previous work? Does it evoke the same type of brand voice as your prior campaigns? If your materials seem all over the place, it’s safe to say customers will think the same for your business. Traditional print marketing today is thriving and an important part of your communication strategy. Nothing grabs your audience’s attention quite like a beautifully designed printed marketing piece. If you’re ready to get your customer’s attention and create high-quality print marketing materials everyone will love, we can help you. Contact Heritage Printing today and we’ll walk you through the creative process for a beautiful finished product!